Situated by the shores of Dingle Bay, on Europe's most westerly peninsula, the Dingle Skellig is a friendly hotel with a huge reputation for traditional Irish hospitality. The setting is simply stunning; Dingle Skellig sits almost at the mouth of Dingle Bay, overlooking the mountains of Kerry and the timeless landscape of the Dingle Peninsula, one of those quintessentially Irish places. And if you're lucky you may catch a glimpse of Dingle's famous dolphin "Fungie", entertaining visitors in the bay. Many of the hotel's bedrooms are positioned with spectacular views overlooking the bay and each room is hugely spacious, tastefully furnished and very well kept. The decor is cosy and relaxing and each room is well equipped with all the necessary facilities, while bathrooms to are afforded a great amount of space. 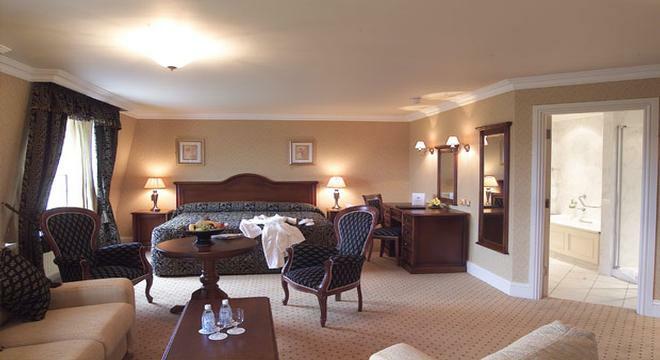 The Dingle Skellig is a large resort hotel offering a huge range of facilities and essentials for a fun family break. The hotel leisure centre boasts new spa equipped with an outdoor Canadian Hot Tub overlooking the bay and a relaxation suite with a comprehensive range of treatments and therapies. The hotel also has a fully equipped gym, 17m pool, Jacuzzi and steam room as well as a children's pool with playful waterfall and bubble feature. The hotel also has activities for children, through a kids club and a creche staffed by qualified carers. The Hotel's Coastguard Restaurant is situated with panoramic views of the bay. The menu specialises in seafood, caught locally each day, coupled with a fine selection of wines. While the spacious Blasket Bar at the Dingle Skellig is the venue for regular live entertainment and music. The hotel is perfectly placed for exploring the wonders of Dingle Peninsula such as the scenic coastal self drive around Slea Head, taking a boat trip out to the deserted Blasket Islands, hiking up Mount Brandon, driving over the Connor Pass or enjoying the traditional "craic" in the many pubs of Dingle town.